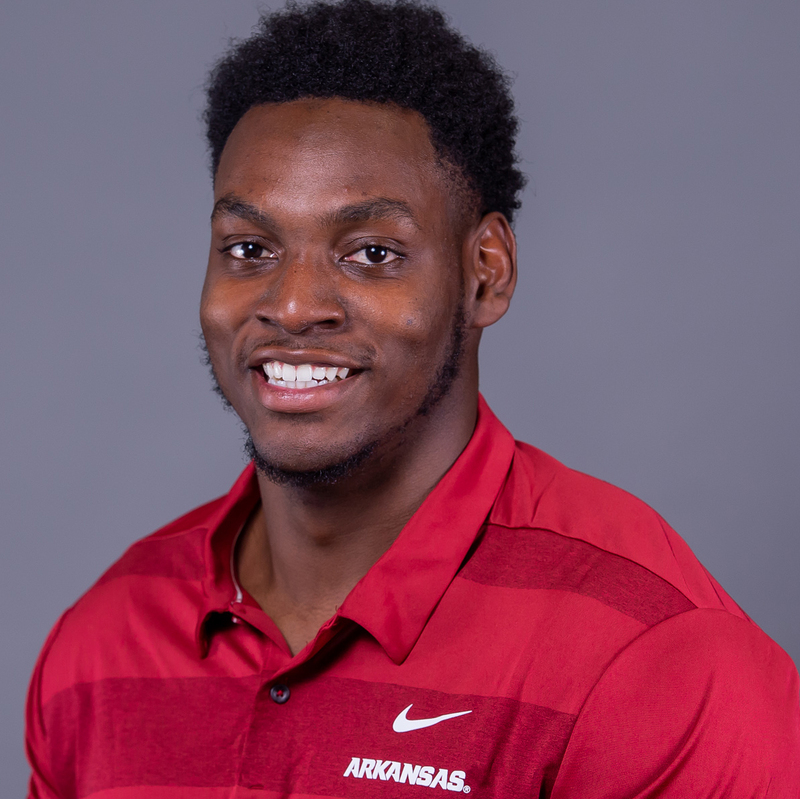 2018 (SENIOR): Started all 10 games he played in at defensive end over his final season with the Razorbacks, missing the first two games of the year … Totaled 507 snaps played in his senior campaign, according to Pro Football Focus, with 481 coming on the defensive line, while also seeing action on punt return and field goal/extra point defensive plays … Finished eighth on the team in total tackles with 32, 16 solo, including 7.0 tackles for loss for 37 yards … Three of seven TFL were sacks, moving the opposing offenses back for 25 yards on the plays … Also had six quarterback hurries and recovered a fumble against Tulsa on Oct. 20 … Recorded at least one tackle in nine of 10 games played, with multiples in seven of those contests … Opened conference play with six at Auburn on Sept. 22, including five solo stops … Also had 2.0 TFL in the matchup with the Tigers … Tallied four tackles against Texas A&M in Arlington (Sept. 29) and against Ole Miss in Little Rock (Oct. 13), with sacks in both games … Notched a 2018-best 2.5 tackles for loss in the rain against the Rebels … Put together a season-high seven tackles vs. Vanderbilt on Oct. 27, featuring his final sack of the season that dropped the Commodores back 10 yards … Consistently graded well in tackling by PFF, posting marks above 74.0 for six-straight weeks, with a best of 80.3 at Auburn … Finished the year with a mark of 71.8 overall in tackling, while finding his best compiled defensive grade against Tulsa at 71.8 … Wrapped his Arkansas career with 1,419 snaps payed on the defensive line, including 769 in run defense … Totaled 105 tackles over his four years, with 18.5 TFL and 7.5 sacks, forcing four fumbles and recovered two. 2017 (JUNIOR): Played in all 12 games with eight starts at OLB … Finished the year with 42 tackles, including 5.5 for loss and 2.0 sacks, six quarterback hurries, two pass breakups and one forced fumble … 4.5 tackles for loss came in SEC action … Made at least 1.0 tackle for lost yardage in four games … Had 1.0 sack in two games … vs. Florida A&M (Aug. 31): Logged his first sack of the year in the season opening win … vs. Texas A&M (Sept. 23): Contributed six tackles, including 1.0 for loss … at Ole Miss (Oct. 28): Posted career highs in tackles (9) and tackles for loss (1.5) … at LSU (Nov. 11): Chipped in four tackles, including 1.0 sack and 0.5 tackle for loss … vs. No. 16 Mississippi State (Nov. 18): Contributed seven tackles with 0.5 for loss. 2016 (SOPHOMORE): Started three of 12 games played … Led the team and ranked fourth in the SEC in forced fumbles (3) … Totaled 23 tackles and tied for third on the team with 5.5 tackles for loss and 2.5 sacks … Had at least one-half tackle for loss in six games … Had a quarterback hurry in three straight conference games … vs. Louisiana Tech (Sept. 3): Forced a fumble with a sack for a loss of five yards in the third quarter … at No. 15 TCU (Sept. 10): Collected two tackles, including one-half sack for a loss of three yards in the second quarter … vs. Alcorn State (Oct. 1): Had two tackles, including 1.0 for loss (-4) … Forced and recovered a fumble during Alcorn State’s final possession of the game … at No. 21 Auburn (Oct. 22. ): Recorded a season-high five tackles … vs. No. 11 Florida (Nov. 5): Helped hold the Gators to just 12 yards rushing and just one first down on the ground … Notched a sack for a loss of 12 yards in the second quarter … Added two quarterback hurries … vs. No. 22 Virginia Tech (Dec. 29): Picked up a career-high 1.5 tackles for loss … Finished with four total tackles. 2014 (FRESHMAN): Appeared in seven games on defense and special teams with one start … Accrued eight tackles, including 0.5 for a loss … vs. Northern Illinois (Sept. 20): Earned first start and recorded two tackles in the non-conference rout of the Huskies … vs. No. 7 Georgia (Oct. 18): Tallied two solo tackles … vs. UAB (Oct. 25): Posted four tackles and 0.5 for a loss in the homecoming win. HIGH SCHOOL: Played cornerback, safety, linebacker and defensive end in high school … ESPN, Rivals and 247 Composite rated him with three stars … Registered 83 tackles, including 34 for loss with 25 sacks, and four forced fumbles to help lead Dillard to eight wins in 2013, an undefeated mark in conference play and a spot in the regional semifinal round of the Florida 6A state playoffs … Helped the Panthers to six wins and the regional quarterfinal round of the state playoffs during junior season … Coached at Dillard by Lorenzo Davis … Chose Arkansas over offers from Kentucky, North Carolina State, Cincinnati, Rutgers and Illinois. PERSONAL: Born on Sept. 7, 1995 … Son of Anna Enewetoks … Criminal justice major.